One of the most common refrains in the media when a man chooses to physically harm of kill is current or former partner is 'it was an isolated incidents'. In the UK, we have 2 of these 'isolated incidents' a week - a statistic that does not include mothers, daughters, sisters, and grandmothers murdered by relatives. Karen Ingala Smith's Counting Dead Women has named 58 women killed in the UK this year (this total includes women murdered by strangers and non-family members). Far from 'isolated incidents', the prevalence of femicide is evidence of the ubiquity of violence against women and girls in our culture. We use the term 'culture of permission giving' to explain how media and society create the culture in which femicide and all other forms of violence against women and girls occurs. The image below is of a greeting card that was found for sale at a book shop last week - which has since been removed. 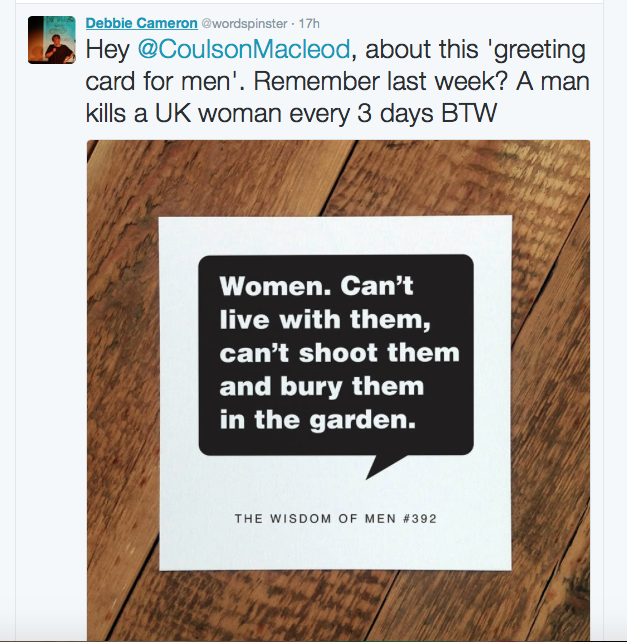 This is the context in which violence against women and girls occurs: greeting cards that make 'jokes' about killing women. If we are genuinely committed to ending the culture in which violence against women is not only condoned but thrives, we need to challenge these 'jokes' as much as we challenge police and the criminal justice system for failing to take male violence seriously. Small pieces of activism - such as removing these cards from a bookshop - are as essential as raising unduly lenient sentencing to the Attorney General's office.